We're counting down the days until spring's arrival, but we also can't stop thinking about this beautiful December elopement! This couple is so sweet, and their Christmas-inspired details were magical. Their wedding was intimate, romantic, and full of ALL the candlelight! Brooke Proctor took these photos, and they could not be more beautiful! 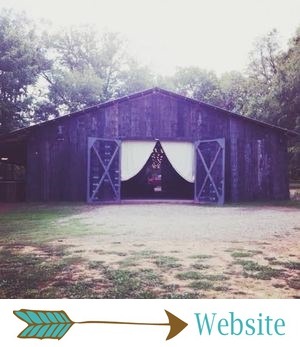 Elopements at The Barn are a huge deal - they're what we're asked about more than anything else - so if you're curious about our elopement collections, click here for all the details! Maranda and Mark were married at The Barn at Twin Oaks Ranch on December 9, 2017. Their colors were burgundy and navy, and their details were romantic, wintry, and a tiny bit boho. Maranda wanted a Christmas theme, "but without the snowflakes and all that," she said. We used candlelight throughout their details to create super romantic, cozy vibes! "If you know me...you know I love candlelight and sunsets," Maranda said. "That was the most important part to me. I wanted my hopeless romantic, bubble bath with candlelight, sunset watching, love story reading parts of me to shine through, and they did. Perfectly." 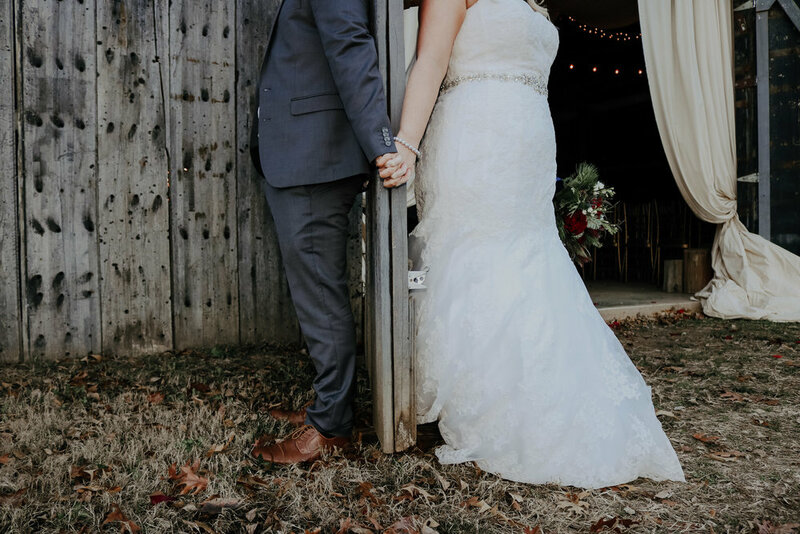 Maranda's gorgeous dress came from David's Bridal, and its trumpet silhouette, beautiful lace, and touch of bling have us swooning over here! And while we're on the subject of things that make us swoon, let's chat about that bouquet! There's never been a more perfect Christmas-inspired bridal bouquet, and my favorite detail was probably the navy ribbon. "The pine cones and roses, omg," Maranda said. "I still have it on my dresser. I will never throw it out. It’s still beautiful a month later." My favorite photos from this wedding are these super romantic portraits. 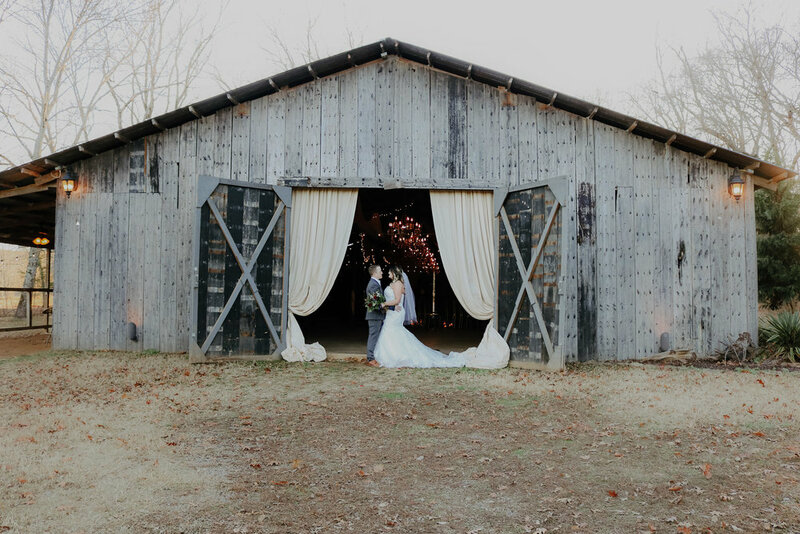 Not only is this couple gorgeous, but The Barn just looks so darn pretty in these! We love the moody, wintry vibes in these photos! Maranda and Mark said their I Do's inside The Barn in a very intimate ceremony. Their details were super romantic, and The Barn has probably never looked so cozy! Their aisle was lined with red rose petals, lanterns and candles. There were hanging bulbs and burgundy drapery at their altar, as well as beautiful floral arrangements that included red roses, pinecones and greenery. I loved the wood elements in their altar, and of course, the candlelight! How adorable is their little white and navy wedding cake?! This was one of my favorite cake displays ever. Maranda and Mark's wedding day ended with a sparkler exit... even intimate elopements need a stunning grand exit! They have yet to go on their honeymoon, but they play to go on one in March!